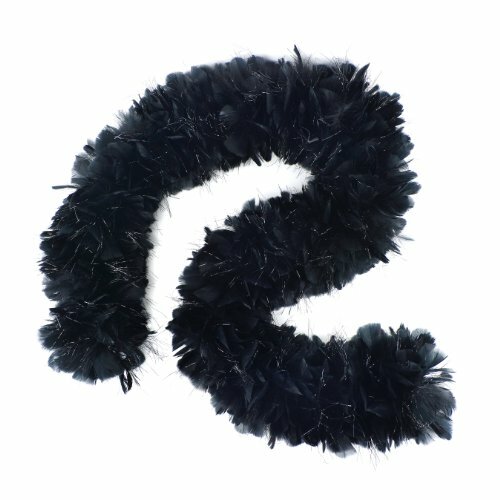 Turkey Feather Boas with Black Lurex are 2 yards (6 ft.) long and approx. 8-10" in diameter. These luxurious looking boas are made from quality Turkey feathers with wide tips. Lurex is a tinsel-like product that is available in opal or black. Its shimmer adds a touch of sparkle making lurex boas unique and great for stage wear. Turkey boas can be cut with wire cutters without unraveling as feathers are sewn on to a nylon cord and cotton-covered wire. The cotton-covered wire helps the boa keep its shape and not come untwisted which enables it to be used as a Rental boa.